sensitivity to stray magnetic or electromagnetic fields. 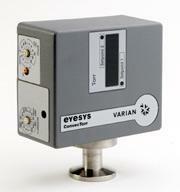 Active gauges are self-contained pressure measurement devices, needing no external gauge controls. Each gauge contains a transducer plus the circuitry necessary to drive the transducer and interpret its signals into pressure data. In order to supply power to, and get readings from, a vacuum gauge transducer, you must have a gauge controller, unless you are using Varian all-in-one Active Gauges. Varian, Inc. offers a variety of gauge controllers, from the simple Model 801 Thermocouple Gauge Controller to the versatile and powerful Multi-Gauge.